not the best 4k ive seen but the best in the compo for sure. The building was really cool but the disconnection of the visuals with the mortal kombat-style music kind of ruined the experience for me. I think, that the music is perfectly connected with the visuals. Rocking intro! I enjoyed that. I can't recall the music too well, so I guess I didn't find it too annoying. Some really neat touches, especially for a 4k. Very impressive IMHO! Awesome visuals that deserve better music. Music was written year ago, not for this particular content and more, it is not replayed correctly. KK changed the pattern order too. Gladiators fighting Arrakis' worms in the raytraced arena! Epic intro! Love it very much. By the way, I think that the music fits quite well! Nice bass. @ninja: Yep. Treat this intro more as a compofiller. Made in 4 days, 2 of which were at the party - which simply means that this couldn't really be a serious entry. But since we are not ASD nor Fairlight, we can release utter crap from time to time. ;) No need to be too serious about it. @ham: No rays were cast while making this production. 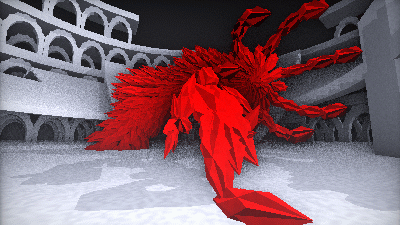 Just crappy depth buffer AO and a way too lowres shadow map. when that kraken-thing began to "dance" to that cheap soundtrack, i had to giggle. @KK: Anyway, that crappy AO and shadow maps did the trick to me. :] Cheers! Polygon-based 4k are rare these days, and this looks good. nice visualisation of architecture and good fightin' in the arena! Not fan of the music either. But otherwise good! Well-done, KK, big thumb up! @logged out: Probably main bottleneck is the CPU running the custom VM. Could have been a lot better with fitting music. But still thumb up. I've missed some of the prods at the party but this one is the best I saw there. Great vibe! Congrats, guys! the actual fight was a bit short, but i can see why. The music wouldn't have been fine if it wasn't for the OrchHit indulgence. the rest was really impressive. good. the orchestra hit thing was funny. certainly something to remember. "you remember the 4k intro with the orch hit?? Music gets annoying, but the rest is pretty good. Slay teh monsta! Maali: I have never seen "X marks the spot" and the similarity may only be very distant anyway. i didn't see the warrior fight. Wow, only 4K. I like both the visual and music! The start remember me some famous brick demos, i would have liked multicolored bricks. it just crash on my machine (win7 + 2500k + GTX560) no matter which resolution i choose. Builds coloseum from scratch, builds monster from halflife and gladiator with rombus pieces. Instant thumbs up! Mighty fine production, really liked how the "knight" is composed of cubes and such. Wish it was more like Golem Arise than what it is. It's okay, but the music is terrible. What Optimus said and for me the music actually fits well to the scene. rulez added on the 2013-10-23 00:58:58 by JAC! Binary doesn't work here (Windows 8.1, NV GTX 650). Great amount of detail! Good idea. Very impressive. Can't really emphasize that enough, but in all other aspects this 4k is boss. Even enjoyed the music. page created in 0.020553 seconds with 15 queries.